We recently blogged about how the University of Washington is deploying 3,000 These Come From Trees stickers across its campus to help reduce paper towel usage. Well, we totally forgot that earlier this summer, the University of Toronto purchased 10,000 stickers for use by their central facilities office to deploy throughout campus. How did we go and forget to blog that? So we're fixing it with this post. According to an email conversation I just had with one of their facilities staff, the deployment went well, and they are happy with the results so far. I'm hoping to get some accurate numbers on usage impact, and hoping that it shows up in the 30% reduction range that we've seen before! Sarah Keller, professor at University of Washington, along with the University's Earth Club, are working with the administration and facilities department to deploy 3,000 These Come From Trees stickers throughout the school. There's a really great article in UW's newspaper about the project. Some notes from the article: they're starting with campus classroom / lab buildings for now with 2,600 dispensers, as a pilot project. 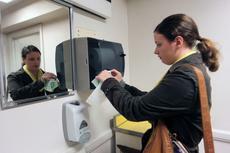 And last year, those 2,600 dispensers were responsible for $180,000 worth of paper towel consumption. Very cool to see more and more institutions of higher education get behind this (like Seton Hall's project). Professor Keller, as a scientist, has promised to work with the facilities administration to track the impact of the program, so we can report it here! Hopefully it's in the neighborhood of the 30% reduction that has been seen by others. It would be awesome if UW saved $60,000 in paper towel costs as a result of these stickers. The Ecology club at Seton Hall University just published a video about their These Come From Trees deployment at the school. It seems the Ecology club worked to deploy TCFT stickers across bathroom paper towel dispenser and napkin dispensers, and then documented the project! What's more, they did some interviewing of people exiting restrooms to document the impact of the stickers. Very cool guys! While there have been hundreds of higher education and professional organizations who use These Come From Trees stickers (well, in addition to thousands of individuals! ), this is the first video we've seen! These Come From Trees goes to Turkey! 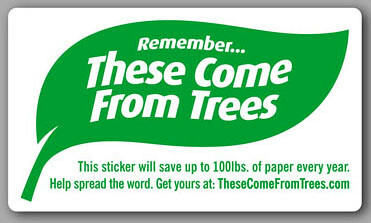 Kemal Hadimli emailed me the other day, noting that he had seen These Come From Trees stickers up around the Google corporate campus (They're one of the hundreds of businesses that use TCFT stickers to reduce their paper towel consumption). He was going back to Turkey, and wanted to see about getting the stickers localized into Turkish. We sent him the proper files in order to translate them, and in no time, he had them translated, but even had his own website set up. Way to go Kemal! 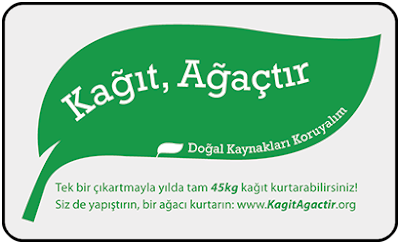 Your Turkish translation joins the Italian and Arabic versions of TCFT stickers!